The “Minimum Correlation Algorithm” is a term I stumbled at the CSS Analytics blog. 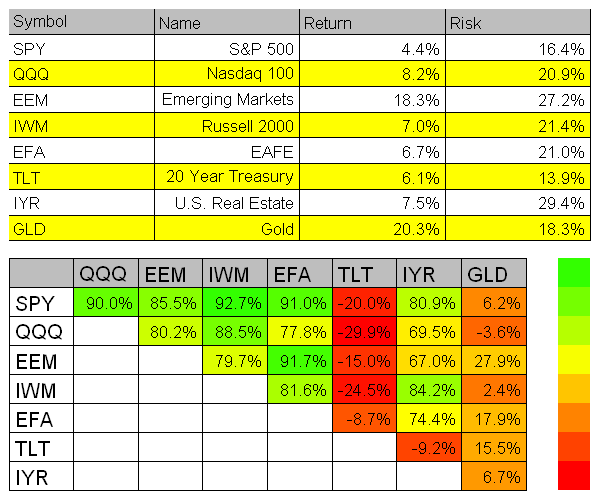 This is an Interesting Risk Measure that in my interpretation means: minimizing Average Portfolio Correlation with each Asset Class for a given level of return. One might try to use Correlation instead of Covariance matrix in mean-variance optimization, but this approach, as I will show below, will not produce the least correlated portfolios. I’m not aware of the method to transform this formula in to the linear programming, so I will use a Nonlinear programming solver, Rdonlp2, which is based on donlp2 routine developed and copyright by Prof. Dr. Peter Spellucci. Following code might not properly execute on your computer because Rdonlp2 is only available for R version 2.9 or below. 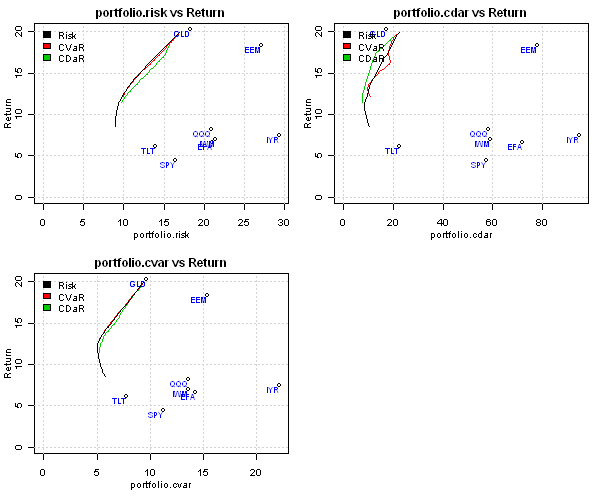 Using Correlation instead of Covariance matrix in mean-variance optimization is a very bad idea to produce the least correlated portfolios. 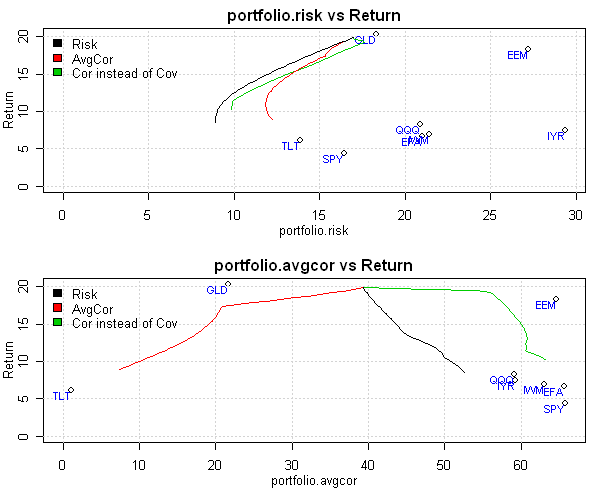 The ‘Cor instead of Cov’ efficient frontier actually increases average portfolio correlation compared to the standard ‘Risk’ efficient frontier. The portfolio composition of the Average Correlation efficient frontier is split between gold (GLD) and bonds (TLT) at the lower risk levels. This is not surprising because both gold and bonds have positive expected returns and low correlation to the other assets. To view the complete source code for this example, please have a look at the aa.avg.cor.test() function in aa.test.r at github. 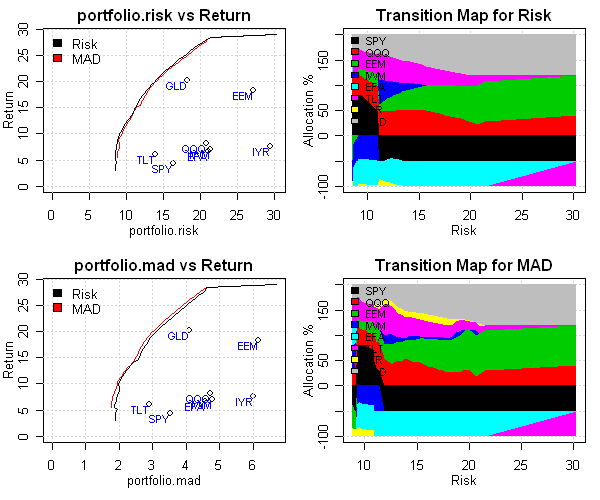 In the last few posts I introduced Maximum Loss, Mean-Absolute Deviation, and Expected shortfall (CVaR) and Conditional Drawdown at Risk (CDaR) risk measures. These risk measures can be formulated as linear constraints and thus can be combined with each other to control multiple risk measures during construction of efficient frontier. 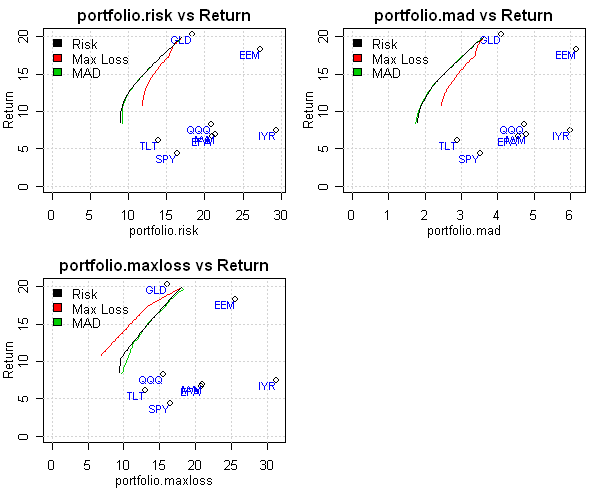 The new efficient frontier, labeled ‘Risk+MaxLoss’, is located between ‘Risk’ and ‘MaxLoss’ efficient frontiers in both Risk, measure by Standard Deviation, and Maximum Loss plots. The main difference between original ‘Risk’ and new ‘Risk+MaxLoss’ portfolios can be seen for their Transition Maps. 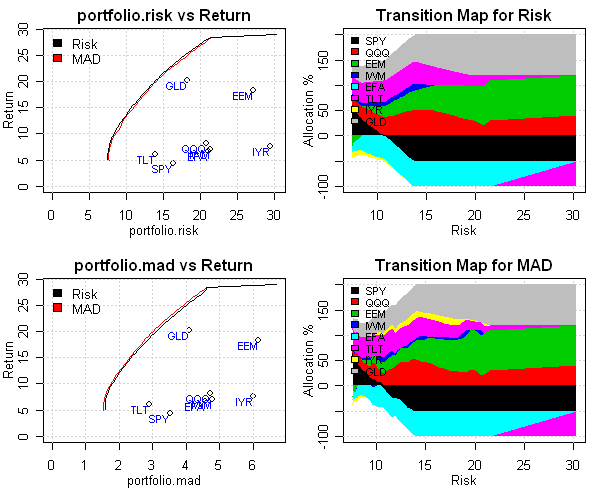 To control Maximum Loss during mean-variance optimization, the ‘Risk+MaxLoss’ portfolios do not have allocation to Emerging Markets (EEM – highlighted with green). To view the complete source code for this example and other examples, please have a look at the aa.multiple.risk.measures.test() function in aa.test.r at github. 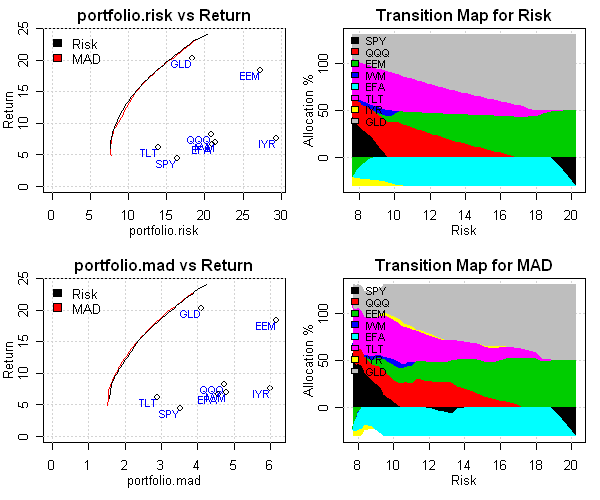 In the Maximum Loss and Mean-Absolute Deviation risk measures post I started the discussion about alternative risk measures we can use to construct efficient frontier. Another alternative risk measures I want to discuss are Expected shortfall (CVaR) and Conditional Drawdown at Risk (CDaR). 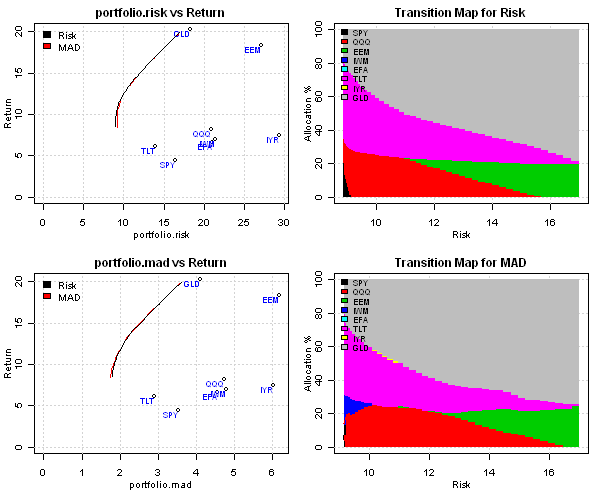 I will use methods presented in Comparative Analysis of Linear Portfolio Rebalancing Strategies: An Application to Hedge Funds by Krokhmal, P., S. Uryasev, and G. Zrazhevsky (2001) and Portfolio Optimization Using Conditional Value-At-Risk and Conditional Drawdown-At-Risk by Enn Kuutanpapers to construct optimal portfolios. The efficient frontiers constructed under Expected shortfall (CVaR) and Standard Deviation risk measures look similar. The efficient frontier constructed under Conditional Drawdown at Risk (CDaR) is superior to the other risk measures in controlling drawdowns. In the next post, I will discuss how to combine multiple risk measures during construction of efficient frontier. To view the complete source code for this example, please have a look at the aa.cvar.test() function in aa.test.r at github. 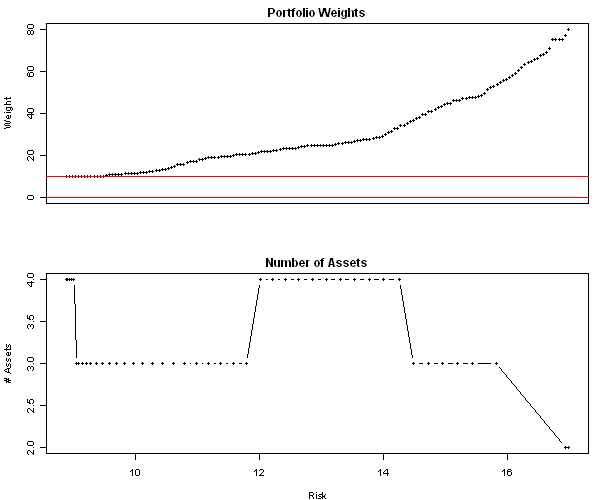 The Minimum Investment and Number of Assets Portfolio Cardinality Constraints are practical constraints that are not easily incorporated in the standard mean-variance optimization framework. To help us impose these real life constraints, I will introduce extra binary variables and will use mixed binary linear and quadratic programming solvers. Let’s continue with our discussion from Introduction to Asset Allocation post and examine range of portfolio weights and number of assets for each portfolio on the efficient frontier. As expected, the portfolio weights range from 10% to 80%, and there is no allocation less than 10%. 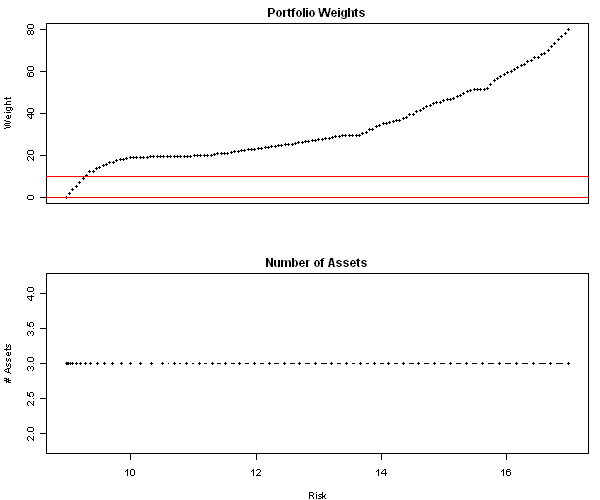 As expected, all portfolios on the efficient frontier have exactly allocation to 3 assets. Please let me know what other real-life portfolio construction constraints you want me to discuss. To view the complete source code for this example, please have a look at the aa.cardinality.test() function in aa.test.r at github. The 130/30 funds were getting lots of attention a few years ago. The 130/30 fund is a long/short portfolio that for each $100 dollars invested allocates $130 dollars to longs and $30 dollars to shorts. From portfolio construction perspective this simple idea is no so simple to implement. Let’s continue with our discussion from Introduction to Asset Allocation post and examine effects of allowing short positions on efficient frontier. 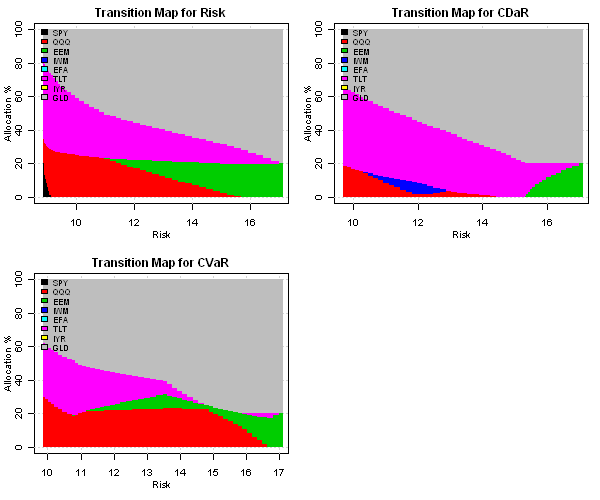 Looking at the Transition Maps, the use of leverage increases as the portfolio’s risk and return increase. At the lower risk, the optimizer wants to allocate 150% to longs and 50% to shorts, and at the higher risk the optimizer wants to allocate 300% to longs and 200% to shorts. Looking at the Transition Maps, the use of leverage is constant for all portfolios on the efficient frontier at 130% allocation to longs and 30% allocation to shorts. 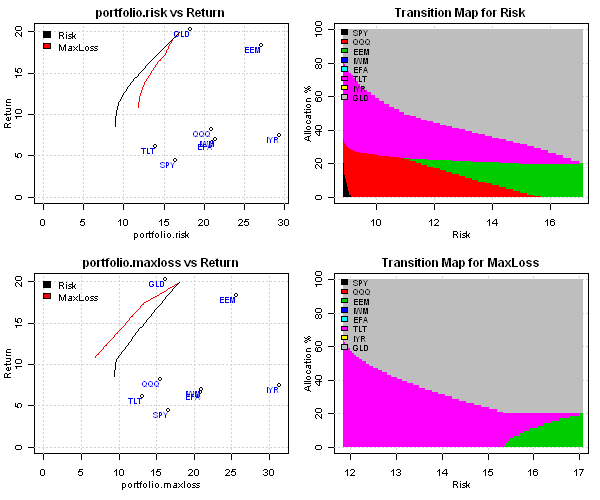 Looking at the Transition Maps, in this scenario the optimizer does not use all the leverage at the lower risk region because optimal portfolios exist at the lower leverage levels. If we look at the at the lower risk region, they are not mutually exclusive, both are grater than 0. 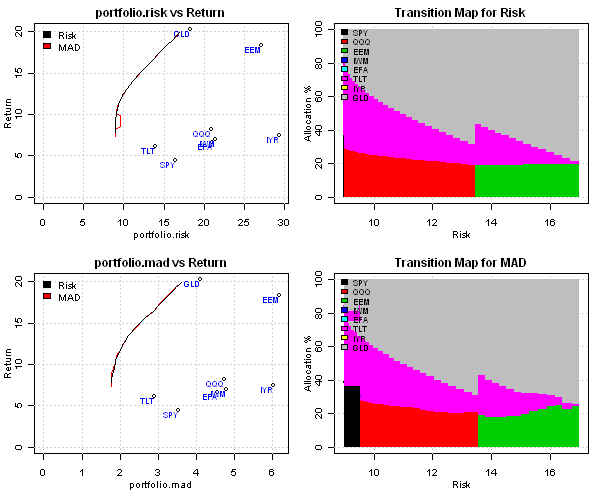 Finally, looking at the Transition Maps, the use of leverage is constant for all portfolios on efficient frontier at 200% allocation to longs and 100% allocation to shorts. To view the complete source code for this example, please have a look at the aa.long.short.test() function in aa.test.r at github. To incorporate Math Formulas to my WordPress posts, I found following solution that works really well for me. I hope you will find it useful. Let’s start from the beginning. I wanted to add Math Formulas to my WordPress posts and after searching WordPress support, I found LaTeX tag. It sounds simple: embed your equation’s LaTeX syntax like this $latex your-latex-code-here$. The only problem is I don’t know LaTeX syntax. I looked around for a stand alone application that can render LaTeX with preview pane. LEd looked promising until I realized that I would need to install an additional LaTeX typesetting, like MiKTeX – a whooping 160 MB. Instead I decided to look for online solution and CodeCogs LaTeX Equation Editor works perfectly. It has buttons at the top for different operators and formulas and more importantly it renders, very fast, the formula as you type it. 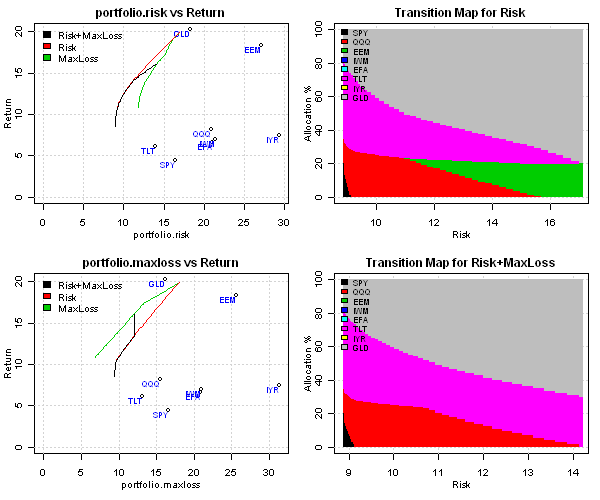 During construction of typical efficient frontier, risk is usually measured by the standard deviation of the portfolio’s return. Maximum Loss and Mean-Absolute Deviation are alternative measures of risk that I will use to construct efficient frontier. 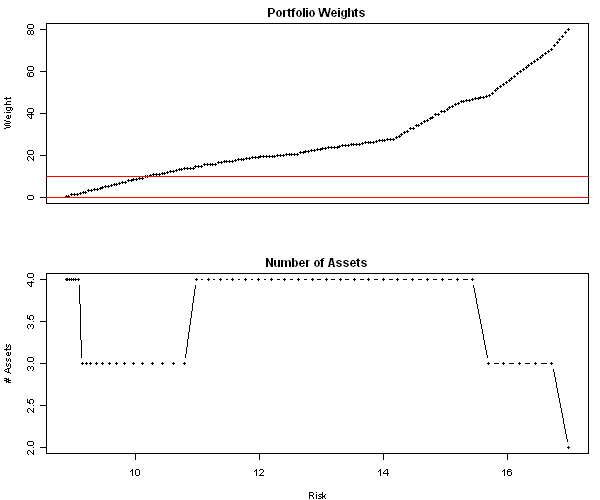 I will use methods presented in Comparative Analysis of Linear Portfolio Rebalancing Strategies: An Application to Hedge Funds by Krokhmal, P., S. Uryasev, and G. Zrazhevsky (2001) paper to construct optimal portfolios. 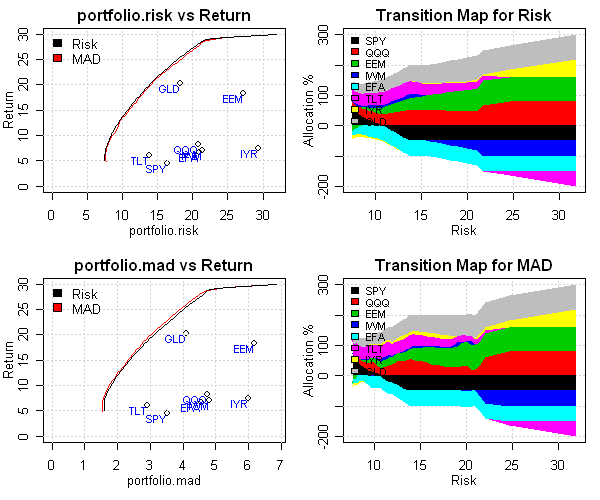 The Mean-Absolute Deviation and Standard Deviation risk measures are very similar by construction – they both measure average deviation, so it is not a surprise that their efficient frontiers and transition maps are close. 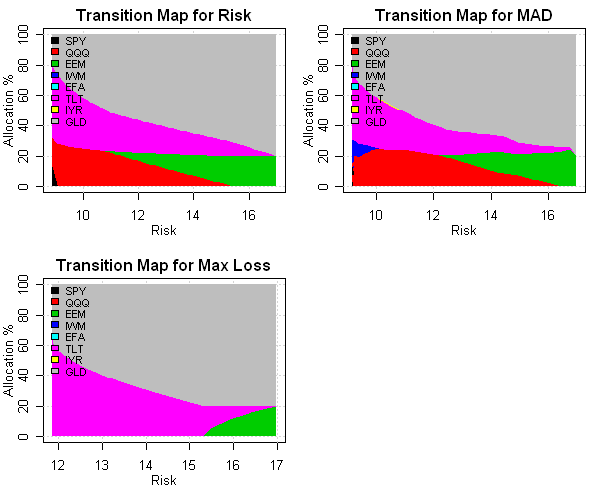 On the other hand, the Maximum Loss measures the extreme deviation and has very different efficient frontier and transition map. To view the complete source code for this example, please have a look at the aa.test() function in aa.test.r at github.